You won't go wrong with this Wrangler Men's White Plaid FR130WH Flame-Resistant Western Work Shirt that delivers western flare and adds plenty of style to your workwear in a classy design that helps keep you safe, too. When you choose Wrangler quality, you get long ... (see full details) (see specifications) #FR130WH. You won't go wrong with this Wrangler Men's White Plaid FR130WH Flame-Resistant Western Work Shirt that delivers western flare and adds plenty of style to your workwear in a classy design that helps keep you safe, too. 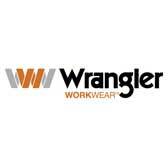 When you choose Wrangler quality, you get longer wear, plus style and comfort, too. Add this flame-resistant button-down design to your workwear lineup. This lightweight white shirt with a subtle plaid design is made from a 6.5-ounce blend of 88% cotton and 12% nylon FR sateen, delivering the perfect combination of cotton comfort and nylon strength for a men's shirt that always keeps up. For flame-resistant safety, this men's workwear design meets NFPA 2112 requirements and NFPA 70E, ASTM 1506 and OSHA Rule 1910.269 standards. It's rated HRC2, ATPV 9.5 CAL/CM2. An additional feature is an orange safety ID on the left sleeve for high visibility. The neat spread collar and the full snap-front closure give you a professional edge. Adjustable cuffs feature three snap closures for the exact fit you need and plenty of room for rolling up your sleeves. Two front chest spade pockets feature flaps that snap closed, and the left pocket features a pencil slot for your convenience plus a Wrangler FR label. The flap and snap closure keep your important items contained and dirt or debris out of your pockets. Authentic front and back western yokes add to the western appeal while offering you room to move and reach as well. Machine washable, this men's FR work shirt is easy to care for following instructions with the garment. Wrangler is known for its durable workwear, and when you need tough wear, professional style, and flame-resistant protection, count on this Wrangler Men's White Plaid FR130WH Flame-Resistant Western Work Shirt from Working Person's Store. Wrangler Shirts: Men's White Plaid FR130WH Flame-Resistant Western Work Shirt is being added to your cart.